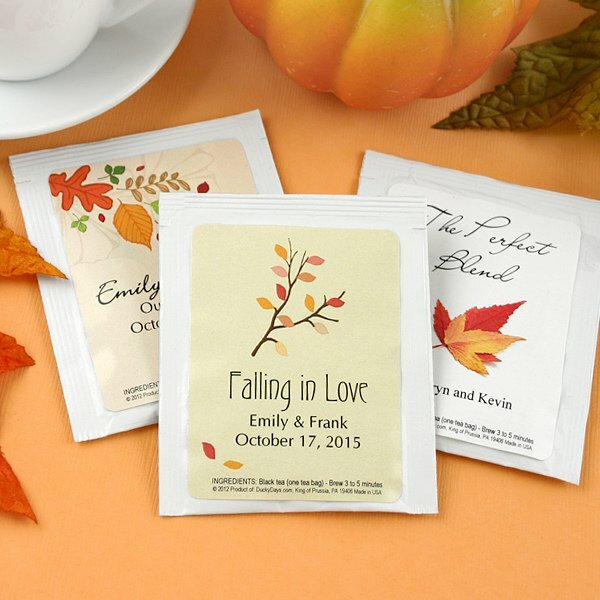 Treat your friends and family to a warm, relaxing cup of tea with our Autumn Tea Personalized Wedding Favors. A lovely favor for your event, each single serving tea packet is customized with the design of your choice along with 3 lines of text.Easy assembly with self-stick labels. For an extra fee we will assemble the labels for you. Each white gloss foil-lined envelope holds one traditional black tea bag and measures about 2.5" wide x 3" tall. Easy assembly with self-stick labels. For an extra fee we will assemble the labels for you. Are the fall tea bags fall flavored? 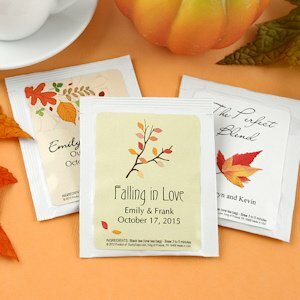 Yes, the Autumn Tea Personalized Wedding Favor a traditional black tea flavor.